CBS RADIO’s Play.it and Simon & Schuster Launch “The Paper Donkey Podcast” Today | News and Corporate Information about Simon & Schuster, Inc.
NEW YORK – Oct. 26, 2016 – CBS RADIO and Simon & Schuster today announced “The Paper Donkey Podcast,” a conversation between writers and editors about their work, the page and process, hosted on the Play.it network. The 45-minute long show will be released every other Wednesday via Play.it/PaperDonkey and iTunes, beginning today, Wednesday, Oct. 26. This is the second podcast created by CBS RADIO’s Play.it in collaboration with Simon & Schuster. 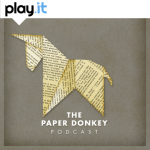 “The Paper Donkey Podcast” puts contemporary authors in conversation with their editors, moderated by host Victoria Taylor, to discuss writing, publishing and more. 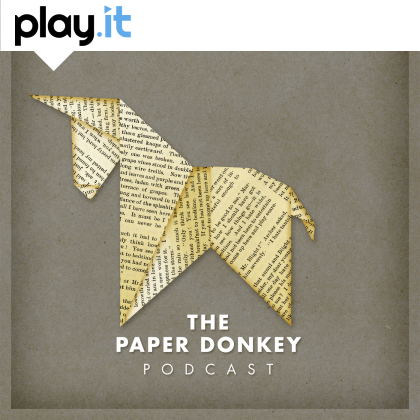 “The Paper Donkey Podcast” also provides a unique opportunity to peek behind the curtain of literary relationships—an inside look into the editorial process. Listeners will gain perspective on how books are written, edited and published, with insights into a writer’s creative process and overall body of work. With access to both talented writers and renowned editors, these conversations will highlight some of the creativity and advice that professionals can share with aspiring authors and fans alike. The name of the podcast is inspired by an executive editor at Simon & Schuster, who was reminiscing about his early days in publishing—he jokingly referred to editors and authors as “paper donkeys” lugging stacks of paper manuscripts wherever they went. The expression captures the heavy lifting that happens behind the scenes of the publishing industry. Host Victoria Taylor joined WeWork as the director of digital community after previously serving as reddit’s director of communications and director of talent, assisting with AMAs and more within the reddit community. Besides hosting “The Paper Donkey Podcast,” Victoria has also hosted the series “innoVaTe” for Vermont PBS. The proud owner of 593 books, Victoria is originally from Milwaukee, Wisconsin, and is based out of New York City. Episode 1: Air date 10/26: Marysue Rucci, Simon & Schuster Editor-in-Chief, and best-selling author Rebecca Traister discuss All the Single Ladies. Episode 2: Air date 11/9: Editors Karyn Marcus and Megan Hogan speak with author Elizabeth Greenwood about Playing Dead. Episode 3: Air date 11/23: Ebony LaDelle, editor and marketing specialist, and Amani Al-Khatahtbeh talk about Muslim Girl. CBS RADIO is one of the largest major-market broadcast media operators in the United States and the undisputed leader in news and sports radio. Producing original audio and video content, live events and exclusive programming broadcast via on-air, online and mobile platforms, CBS RADIO reaches more than 72 million consumers nationwide each week. As a part of CBS Corporation, the Company owns 117 radio stations in 26 markets – including all of the top 10 as ranked by Nielsen Audio – as well as an extensive array of digital assets. CBS RADIO distributes its programming via AM, FM and HD Radio stations, Radio.com and CBS Local Digital Media apps, making engaging with audiences easier than ever before. For more information on CBS RADIO, please visit www.cbsradio.com.